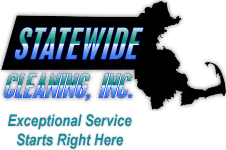 Statewide Cleaning provides both commercial and residential customers in the Greater Boston area with a broad array of professional fabric cleaning, hard surface cleaning, and specialty cleaning services. Effective carpet and upholstery cleaning requires top of the line equipment along with knowledge gained from years of experience. Tell us a little bit about the job you need done and request a quote today! The beauty of tile flooring is hard to beat, but so is the grout. We go beyond the scrubbing systems of the past to get the job done right. Our equipment has the power needed for your toughest jobs. We also stock Green Cleaning products for the eco-conscious.